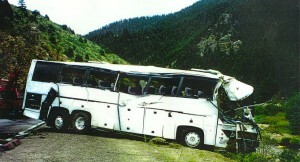 More than 24,000 Americans were injured in bus accidents last year. More than 200 Americans were killed in fatal bus accidents last year. Since 2005, the number of bus accidents that took place on U.S. roadways has been increasing (likely due to the fact that there has been an increased number of buses traveling on U.S. roads). Vehicle equipment defects (This may be a factor when the company that manufactured the bus/bus equipment or that is responsible for maintaining the bus has behaved negligently). It’s important to note that the “driver” mentioned above can refer either to the bus driver or to other drivers on the road. If a bus crash is caused by the negligence of the driver of a different vehicle, injuries to multiple passengers on the bus can create challenges of finding adequate insurance coverage and fairly distributing the proceeds. Cederberg Law has experience finding all available insurance and organizing and working with multiple parties and lawyers to fairly settle multiple claims. If you or a loved one has been injured in a bus accident – or if you have lost a loved one in a bus accident, call the Boulder bus accident lawyer at Cederberg Law at 303-499-0449 or email us using the form at the left-hand side of the screen. Since 2011, our attorney and his legal team have been successful at securing results and compensation for people who have been seriously injured in bus accidents caused by other individuals’ negligence and recklessness. Having handled countless cases, our attorney and his legal team have a deep understanding of the law, as well as the legal experience you need. He can fiercely defend your rights in any legal setting, aggressively litigate on your behalf in court, and skillfully negotiators outside of court. This makes our trusted lawyer a formidable force that will not back down until you secure the maximum possible compensation for your injuries, expenses and losses.